Fourteen people were injured Saturday at an Oklahoma casino when a storm knocked over trusses at the entrance at a Backstreet Boys concert, casino officials said. 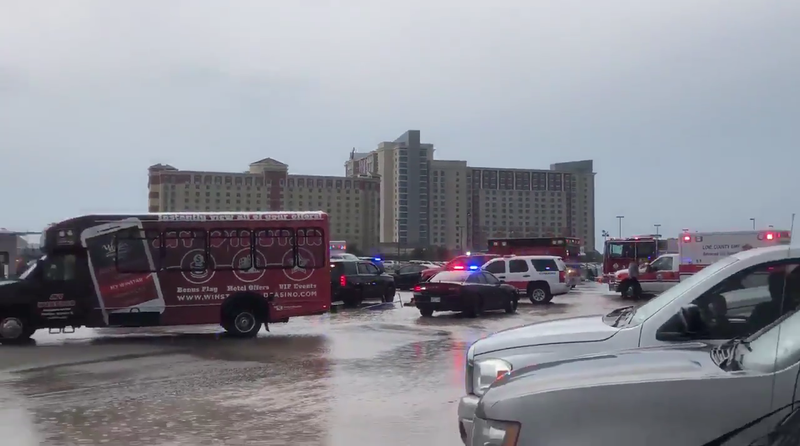 Officials from WinStar World Casino in Thackersville, Oklahoma, said they were evacuating the outdoor concert venue due to storms, and had asked patrons to seek shelter. According to the casino, about 150 people waiting in line for the Backstreet Boys concert were still outside when 70-80 mph winds and heavy rain hit, knocking down the trusses outside the entrance. Casino officials said 14 people were taken to local hospitals. "We know that fans often suffer through inclement weather for their favorite acts, but this was an unusual event and our thoughts are with those who were injured during this storm," the casino said in a statement. The Backstreet Boys tweeted they had decided to cancel the show due to the injuries and severe weather. They said they would "attempt to reschedule." Backstreet Boy Nick Carter had tweeted earlier they are "waiting and praying for our fans that were injured. If we can perform were ready to go. But safety is first." According to CBS Dallas / Fort Worth, strong storms, some of them severe, moved through the region Saturday evening, leaving behind damage and wet conditions for residents. Radar estimates show a range of 3/4″ up to 2″ of rain has fallen through the evening in North Texas.